Map browsing on the web is now commonly used, and most people have used map services such as Goole Maps, Google Earth, and Yahoo! Maps. These services also provide developer API, which makes it easy to integrate map services into the website. Map browsing in practical use is covered with those services, but displaying historical maps as exhibits is not, which requires different approaches. 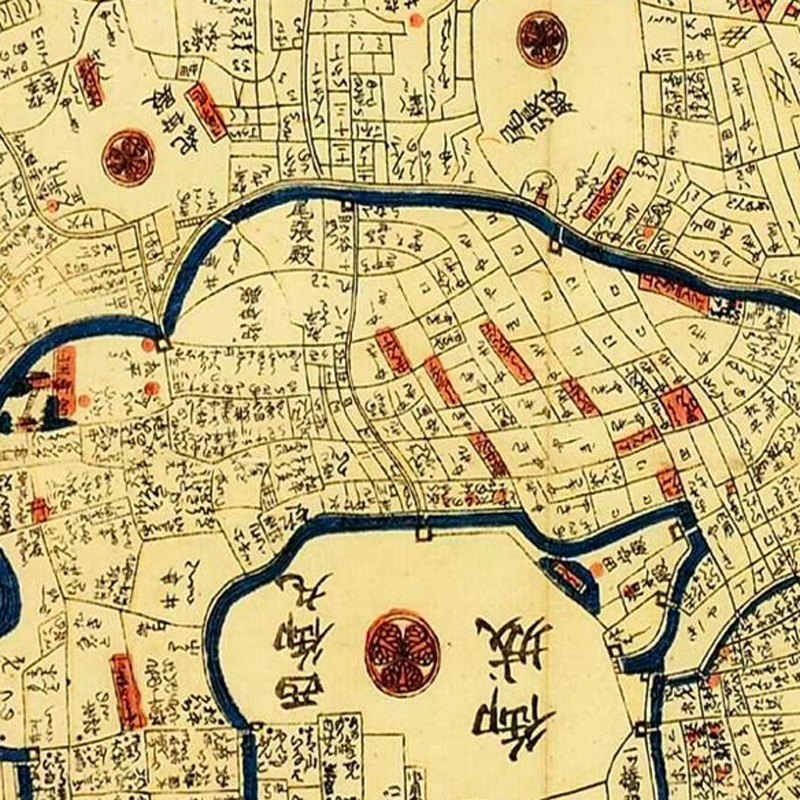 This paper starts with elucidating Japanese historical maps, their unique features and needs. After that, it discusses our image viewer, its design and implementation to meet their needs. Since Japanese historical maps do not have concepts of geo-coding usually and are distorted, it is difficult to integrate them with map services such as Google Maps. Using Keyhole Markup Language (KML) makes it possible to integrate these maps with Google Earth. There is some research on historical maps on Google Earth (Zeile et al. 2007Nishimura et al. 2007). Although those tools are highly functional for defining 3D geographical information on the web, the user interface is not easy to use for traditional humanities scholars who are normally not familiar with KML language. Moreover, setting the image in Google Earth is not always their priority. Therefore, when it is necessary to exhibit original, hand-drawn maps on the web, one has to take different approaches to integrating these images into the web. Because of these issues, image viewers are usually used to implement historical maps for exhibition. These viewers enable users to zoom images, and to see their details if they are provided in high quality. Moreover, today’s high technology for user interface allows us to use such viewers with regular web browsers. In this section, we discuss what kinds of features are required for historical map viewers, and compare them with related software. When displaying Japanese historical maps as image exhibits on the Web, we encounter difficulties in handling angles. With no clear concept of top or bottom in these maps, names of places are labeled from many directions. This is related to the fact that people in those days put rather a large map on the table or the floor to read it. Because of this particular feature of the historical maps, as opposed to maps today, browsing tools for these historical maps should provide a way of viewing them from multiple angles. Therefore, we decided to design our tool to support flexible browsing rather than geographical accuracy. Google Maps/Google Earth: Since their beginning, these services with web browsers have become more commonly used, and more people have become used to them, which in turn has changed the way we access geographical resources. However, historical maps do not have accurate longitude and latitude, and even using KML to integrate them into Google Earth, the images are distorted and we need to change the purpose to display them. Plus, KML is rather complicated to maneuver it very well. GMap Image Cutter by LCUGMap Image Cutter by LCU: : To use Google Maps image viewer, LCU developed GMap Image Cutter tool to cut a large image into many small pieces. With this Cutter provided, users can integrate images to their own website with the same Google Maps user interface. OpenZoom: : OpenZoom is a free and open source toolkit for delivering high-resolution images and zoomable user interfaces. Like GMap Image Cutter, it can cut a large image into many small file-size images. With this software, users can download an appropriate file size to their local computer, which works to prevent network traffic from congesting in cases in which the image is too large to download. This is SWF based, and requires a Flash Plugin. Ojikit ImageViewer: Ojikit Image Viewer is the toolkit we have developed. It has zooming, panning, rotating features, as well as an open source license. While it does not have the function to cut a large image into smaller files, improvement of broadband allows us to transfer files without so much reduction. Moreover, one file is easier to store and manage than many files. We have applied this tool to Japanese historical maps as our Center has a large number of historical map images, open to the public. Unlike other image viewers, which do not support rotating function, this toolkit enables us to rotate all images. Figure 2 shows one example of these map images as they look on the screen. With this toolkit, users can read labels written from many directions, as they are on the map. Figure 2: The left map is rotated 130 degrees, and the right map is rotated 210 degrees. 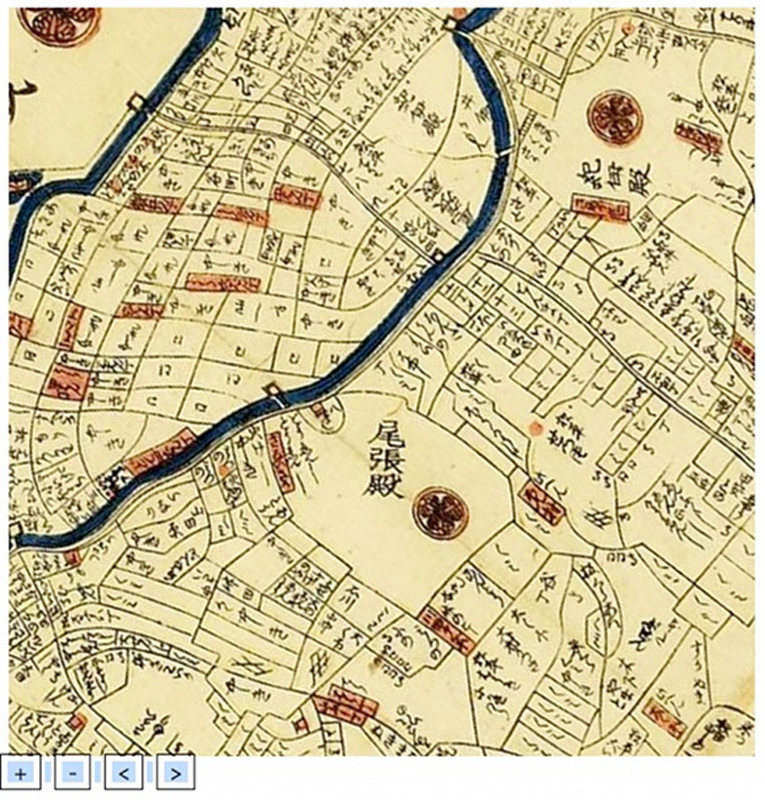 Addressing a culture-specific problem of Japanese historical maps, this paper discusses current map viewer systems to deal with this problem. 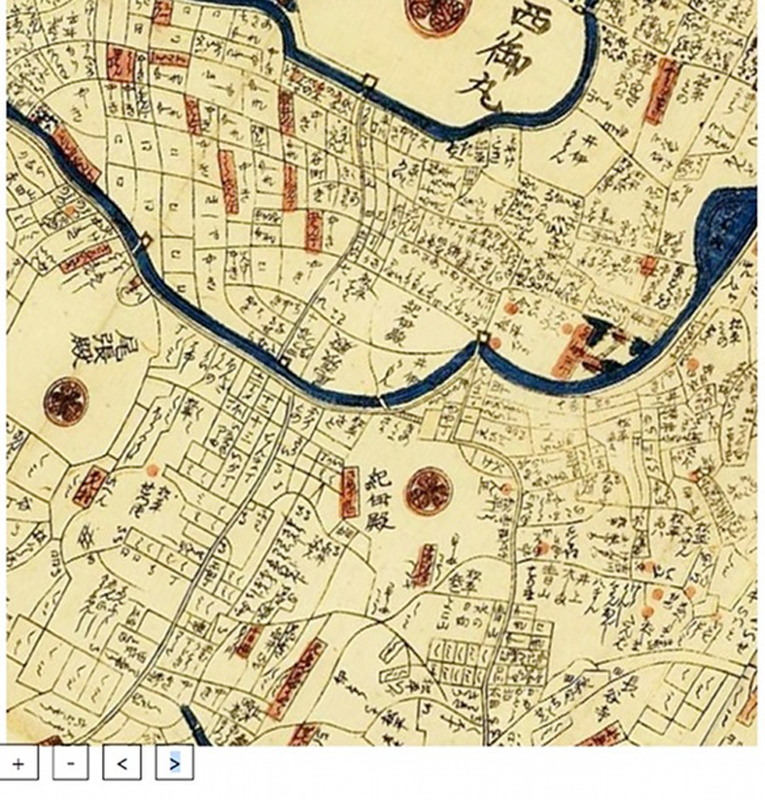 This toolkit was developed as a viewer for Japanese historical maps per se. However, its extensive and easy integration feature leads us to consider some other possibility to apply it for other fields that have similar demands such as rotation and zooming features with easy integration. While this toolkit’s development is our on-going project, its source code is meanwhile open to any users. There are three future areas of research related to our toolkit. First, we have applied our toolkit to Japanese old maps browsing as a test this time, and we are trying to produce more tests with the toolkit. Secondly, related to the first point, we think that this toolkit is useful not only for maps, but also for other images that need to be browsed from many different directions, such as handwriting manuscripts, and apply different resources. Finally, this toolkit does not consider geo-reference. In our center, there is a group for GIS research, and for future provision, we are discussing how to co-reference its geographical information with each other, so that this tool can represent geo-reference.